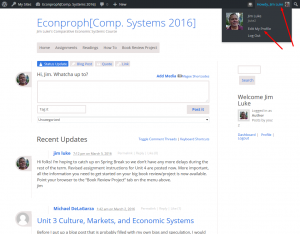 To post a comment on a Unit discussion (and get points credit for it), you need to be logged in to this website first. 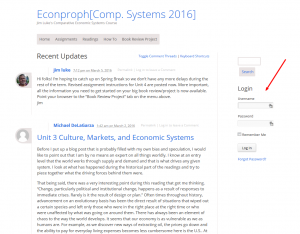 Go to the home page for this site: https://compsys16.econproph.net as shown in this screen shot. Enter your username which is the same as your school username. Enter your password. Your password was supplied in an email at the beginning of the course. If you are using your personal computer, you may wish to click the “Remember Me” box. This will allow your browser to remember your username and password, making future logins easier. Do not click the “Remember Me” box if you are using a shared computer such as one in the computer labs at school. If you forget or have lost your password, click the “Forgot Password” link just below the Log In button. This WordPress-based system will send an email to your school email (….@mail.lcc.edu). Get that email and follow the instructions to re-set your password. Passwords must be strong passwords. Your profile includes details such as what name is displayed on your posts as well as your avatar/picture. You can also change your password from the change profile page. To access the change profile page, first login. Then when you are logged in, click the “Howdy, -your name-” on the black admin tool bar at the top right corner. When the little drop down menu appears, click on Edit My Profile as shown here.